It’s a project conceived for if:book Australia by literary technologist extraordinaire, Simon Groth, in collaboration with the brilliant literary and digital author, Kate Pullinger. As CEO of QWC, I support and manage if:book, an R&D digital publishing unit founded by the visionary Kate Eltham. Yeah, I freaking love my day job. 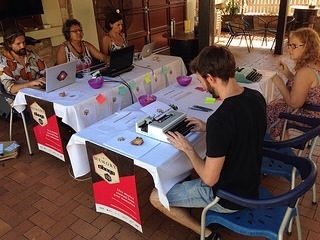 But I’m also a writer, and I was deeply impressed by the courage and agility of the three authors writing and publishing live to the web, crafting narrative from crowdsourced memories, serene and focused in the sweltering humidity of Darwin. Maria Munkaro, Levin Diatschenko, and Kamarra Bell-Wykes were champions, and the original works they produced are each unique and powerful. Read them here. Contemporary evolution of the read/write relationship from symbiosis to synthesis both anchors and heightens narrative interest. Contributing my own memories to the project added a striking layer of frisson. I had skin in the game. Levin created a sophisticated, magical realist, episodic narrative – a cosy, feisty conversation the likes of which you could envision in the back room of a pub in LOTR. Levin used contributions to inspire his characters. Dad’s moustache: A toothbrush moustache that started out glossy black, fading over the decades to silver, with ochre hints of tobacco. With that, he shuffled out of the bar and slammed the door behind him. I do not know if his mustache went grey. Maria wove a delicate, deep poem around her theme of Recurring Dreams. Ranging from crowdsourced experiences of both joy and nightmare, to resonances of a psyche formed in Australia’s Stolen Generation, Maria approached her piece with the optimism, grace, and intellect she brings to all her work. Kamarra’s experience as a playwright are evident in the striking call-and-response structure of her piece. Riffing off contributed memories and entwining her own, Kamarra’s clear authorial voice creates a compelling throughline across a kaleidoscope of scenes and characters. makes me think of zombies and hospitals. Kamarra fed this post-it note glimpse of memory into the wild machine of her imagination to create a detailed and touching scene between a boy, his brother and their mother. The rights and licensing of work for Memory Makes Us were complex to get right, but are simple in effect. The authors and contributors own their work outright and are free to publish and remix it as they wish. If:book Australia has a non-exclusive licence to publish and remix it, too. Last night I realised, along with the flush of pride and the thrill of narrative interest, that the inclusion of my memories in these authors’ beautiful works may make it tricky should I ever wish to re-use my own words – it may look like plagiarism. So it is both as an act of honour to these authors’ incredible creativity, and by way of documenting the provenance of my own contributions, that I reproduce them here. It’s my belief that authors have always been fuelled by the contributions of those around us. Web-enabled writing allows us to capture and investigate this creative process in ways that have great potential for audience development for literary works. Memory Makes Us will appear in Melbourne, Brisbane and Perth later this year. I warmly invite you to participate in this experiment, readers and writers both. Keep an eye on the website memorymakesus.org.au or the twitter hashtag #memorymakesus for more info. I’ll blog about this fabulous Criminal Brief overview of self-publishing over at Speakeasy, but it is so useful I want to share it here as well – for two reasons. In itself, it is a sage warning about the pitfalls of vanity publishing for writers (‘Neither authors nor readers are well-served by self-published fiction’), while outlining the usefulness of self-publishing for certain projects. But also, the site is one for crime buffs to watch, being A Mystery Short Story Web Log Project. Super cool! Fictional or in real life, Melbourne’s upcoming Crime and Justice Festival has it covered. I am crying into my beautiful Pulp Fiction Press edition of Cocaine Blues that I won’t make it to hear Kerry Greenwood. If someone in the blogosphere is going, can you please tweet the highlights? Let me know so I can follow you! Cake Week at the poison doughnut! I want cake week at QWC! I’m reading Writer Mama, and it’s changing the way I view my life. Freelance writer Christina Katz delivers nearly 300 pocket-sized pages of wisdom that will help any writer, not just the mamas among us. Most writers can benefit from advice about how to work from home, be your own boss, build on your strengths, and follow your interests. I read Katz’s Get Known before the Book Deal as research for an article I wrote for WQ, and read in conjunction, Katz’s two books have inspired me to create a framework to organise my writing activites. I devote time to research, generating ideas, networking, and creating opportunities, as well as the actual writing. In between all this writerly biz and mama stuff, I’ve read a few gems lately. The Writing Class, by the wonderfully named Jincy Willett, lived up to its reviews. As a long-term inmate of the crime genre, I especially enjoyed the way it spoofed the nuts’n’bolts of the craft, like the Centre Pompidou above, showing its pipes. Now Larson‘s The Girl with the Dragon Tattoo is waiting patiently on my bedside table, waiting for me to finished some other required reading for work. Anyone who’s read it, please give me the jist, the flavour, the je nais se qua of it all (no spoilers please). 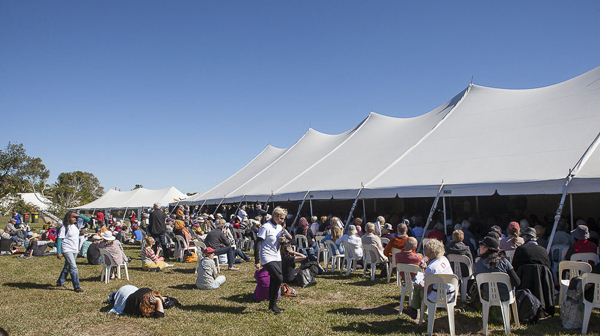 Next week sees the release of the Byron Bay Writers Festival program – check out the Sunday sessions for a surprise late entrant!